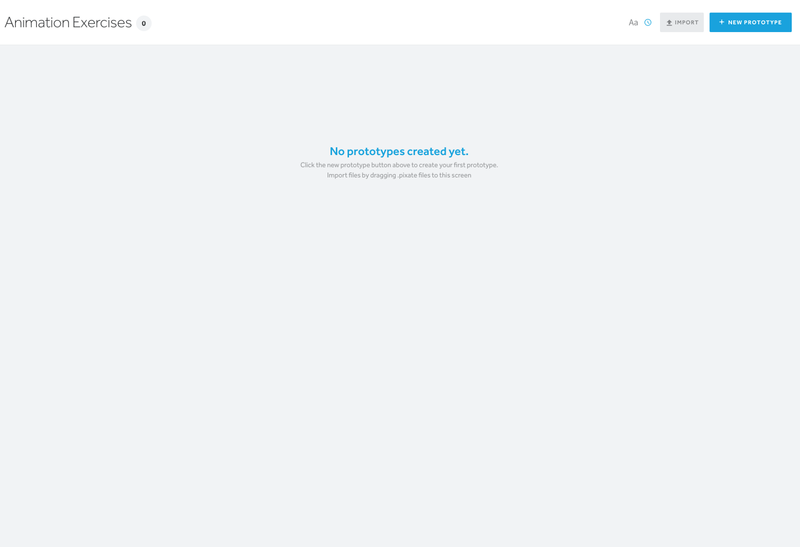 I recently started learning Pixate and it became my main tool of choice for prototyping animations. I use it on a daily basis and it helps me to visually show my engineer the types of interactions and animations I am thinking about and as a resource for the engineering team to refer back to as they build it in code. Pixate is another valuable resource for user testing and showing stakeholders a prototype compared to static mocks. 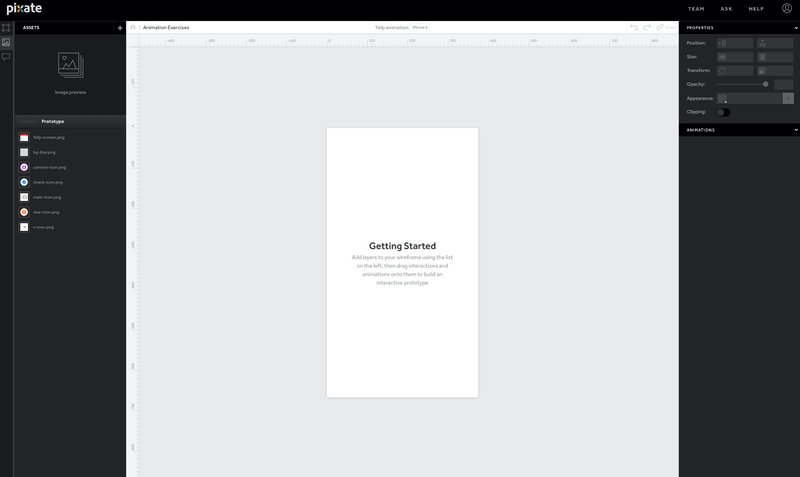 I decided to start writing up tutorials for people to learn how Pixate works. 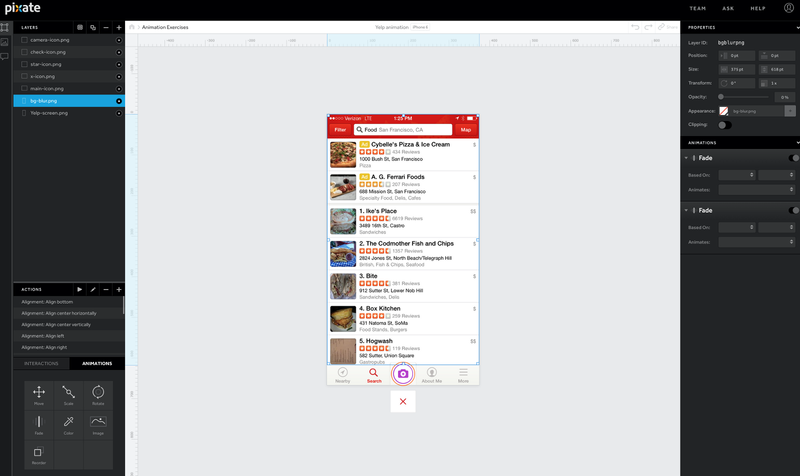 In this tutorial we will create a fly-out menu and I will use Yelp assets as a real world example. I also recommend checking out all the resources on Pixate’s education page which is a great place to start. Note: There are different ways to create these animations and my prototype isn’t 100% the same as the one on Yelp but my goal is to teach you these concepts to help you get started on Pixate. 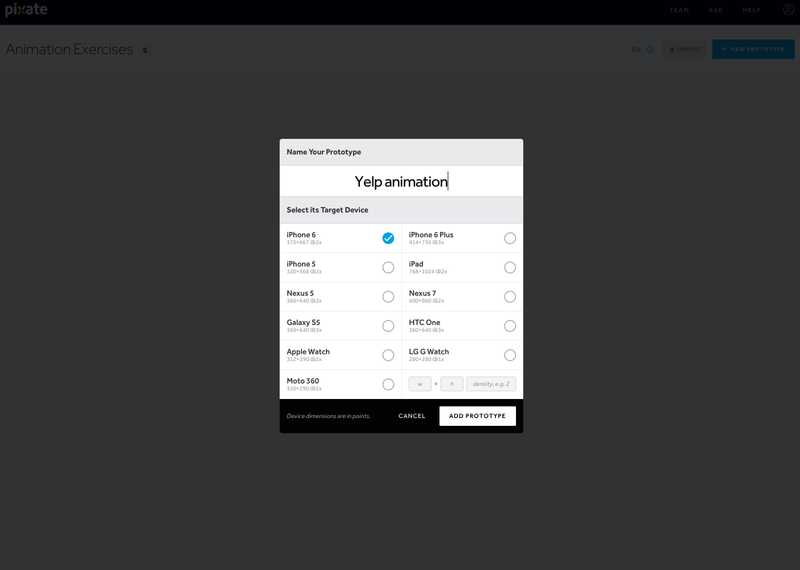 Create an account on Pixate here and download all the assets you will need from this Dropbox folder that I sliced up from the actual Yelp app. I also created and included a Pixate file titled, “Yelp.pixate” where you can see the complete version. 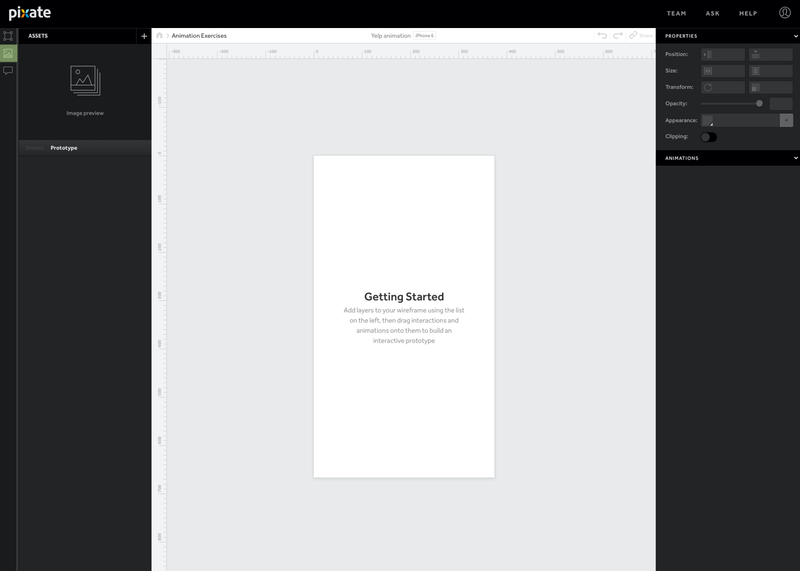 Download the Pixate app on iOS or Android on your phone so you can see this build out in real time and to be able to tap your phone to play with the animations. 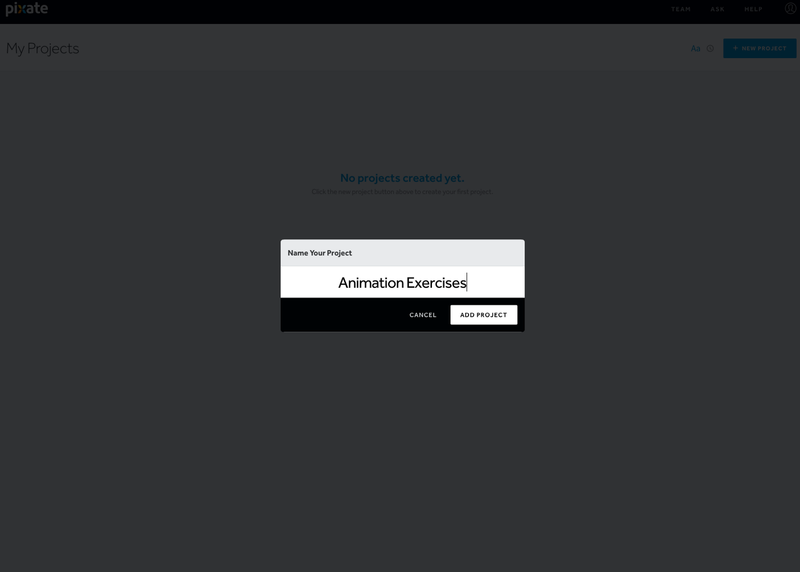 Create a new project and title it anything you like, I will title it “Animation Exercises”. 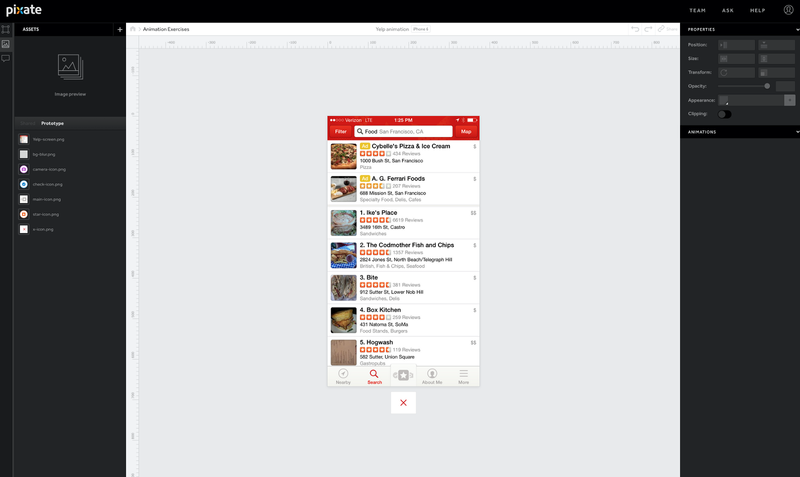 Create a new prototype within the project and title it, “Yelp animation” and for this tutorial I chose the iPhone 6 as my target device. Click on the assets tab on the top left which I highlighted in green for you and drag and drop in all the assets from the Dropbox folder that I created. 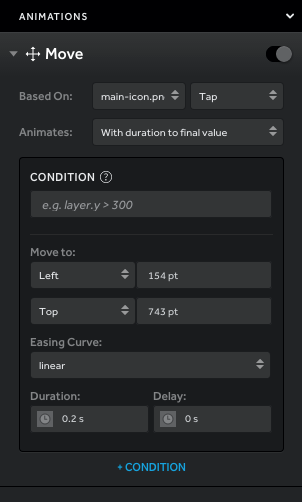 Note: You will be switching through the assets and layers tab often in this tutorial. 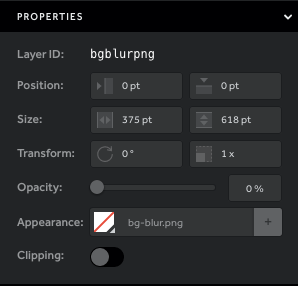 Make sure the “bg-blur” asset is selected and set the Opacity to 0 on the top right in the properties section. This will cause the “bg-blur” to disappear. 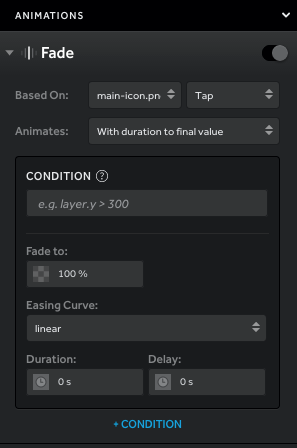 We will create interactions and animations in the following steps to bring back the “bg-blur” when we need it. 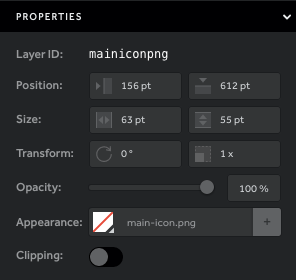 Bring in the “main-icon” asset and cover the original main icon. I included a screenshot of the position properties for convenience. We will be creating animations and interactions to bring in the “x-icon” when the “main-icon” is tapped. Set the opacity for (camera-icon, check-icon and star-icon) all to 0%. Nice! You came this far ☺ All the assets have been imported and are now in the correct place. 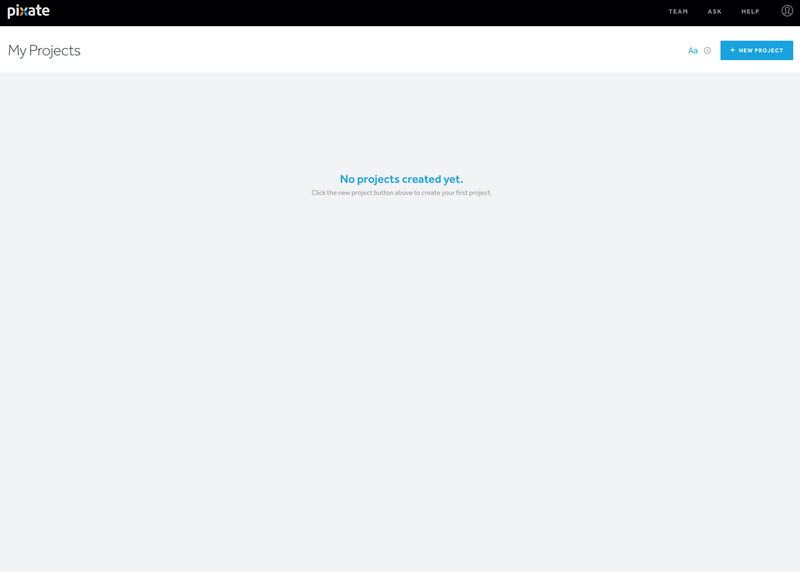 Now we will add “interactions” and “animations” to all our assets to start creating the final product. 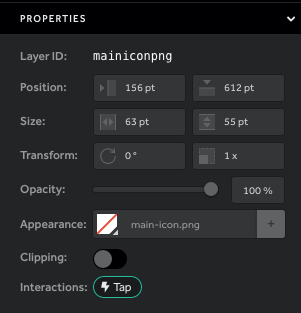 Drag and drop a “tap” interaction into “main-icon” and “x-icon”. 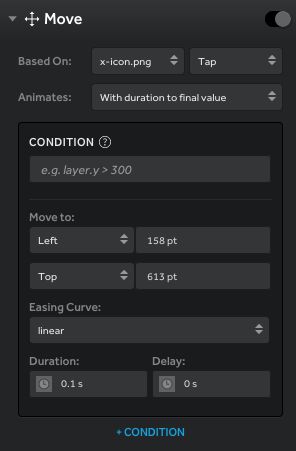 This will allow these assets to trigger other animations we will cover in the following steps. What this will do is when the main-icon is tapped, the “bg-blur” will fade to 100% opacity with a duration of 0.1 s and a delay of 0 s.
Open up your phone and try it out. Note: You won’t be able to make the “bg-blur” disappear just yet by tapping on anything, we will add more tap interactions and animations soon to make it disappear. 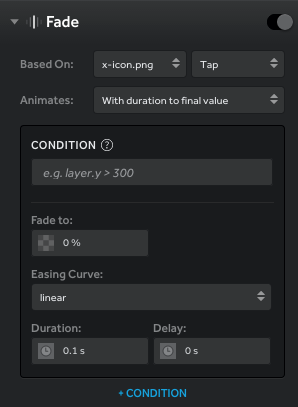 What this will do is that when the x-icon is tapped, the “bg-blur” will fade to 0% opacity with a duration of 0.2 s and a delay of 0 s.
Note: You won’t be able to see this just yet, so you won’t see any changes on your phone until we add more tap interactions and animations. 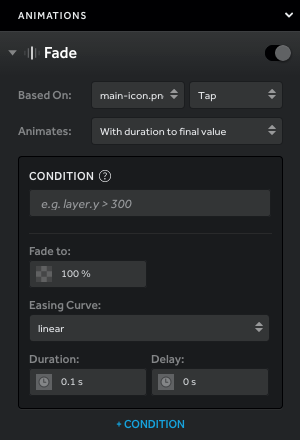 We will now add two move animations to “main-icon”. What this will do is when the “main-icon” is tapped, the “main-icon” will be moved off the screen. What this will do is that when the “x-icon” is tapped, the “main-icon” will move back to its original position with a spring effect. 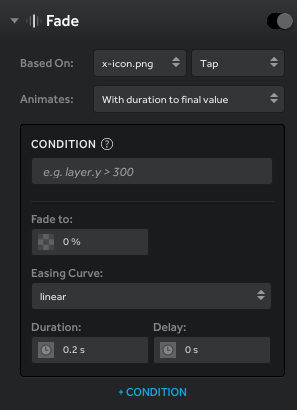 We will now add two move animations to “x-icon”. What this will do is when the “main-icon” is tapped, the “x-icon” will move to replace the “main-icon”. Open up the Pixate app on your phone and try it out. What this will do is when the “x-icon” is tapped, the “x-icon” will disappear and be replaced by the “main-icon”. 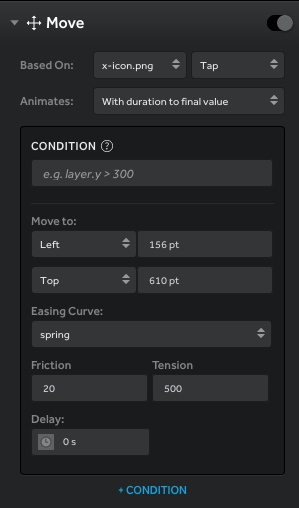 Note that the “main-icon” comes back with a little spring effect due to the spring easing curve I applied. 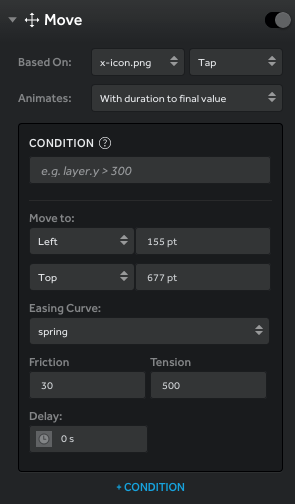 Play around with the easing curve settings to see what cool animations you can come up with. We will now add 2 fade and 2 move animations to “star-icon”, “check-icon” and “camera-icon”. We will first start with the “camera-icon”. This will make the “camera-icon” appear when you tap on the “main-icon”. This will make the “camera-icon” move to the bottom right when you tap on the “main-icon”. This will make the “camera-icon” move to its original position when you tap on the “x-icon”. 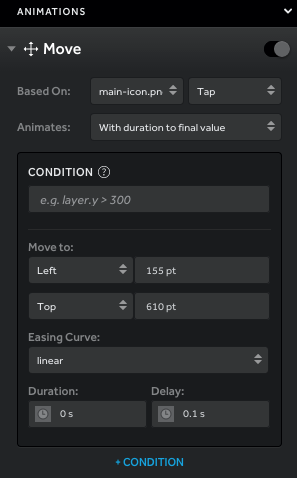 This will make the “camera-icon” fade to 0% opacity so this asset will no longer be visible until you tap on the “main-icon”. Repeat step 13 for the “check-icon” and “star-icon”. “check-icon”: left: 78 and top: 531 with the original position being 158 and 613. “star-icon”: left: 158 and top: 490 with the original position being 158 and 613.